Creditknight has a handy quick start guide that enables you to readily access any aspect of the software’s functionality you’d like to use. 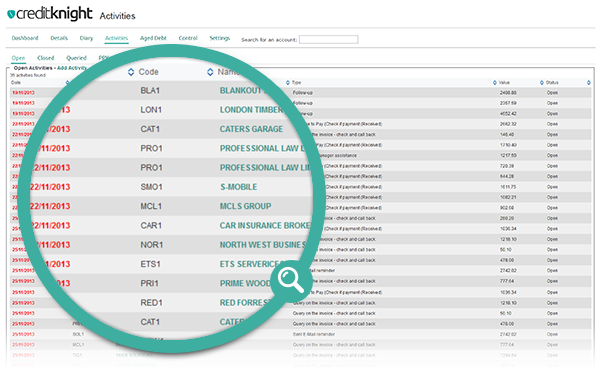 You can get on with a detailed analysis of your cash position or get a snapshot overview of your cashflow via the dashboard. Main activities outstanding on your debtors ledger. 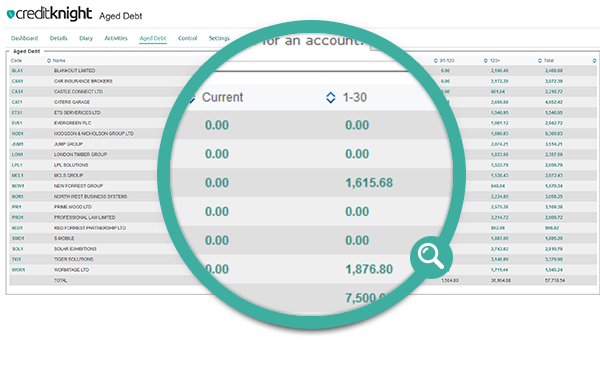 An overview of the position with your top ten debtors including the split of debt between under query, outstanding and not yet due. 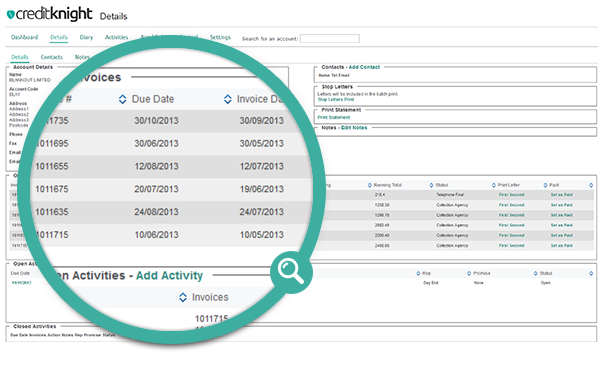 The profile of the activites on your debtors ledger. The age of your debt. When payments have been promised. Debtor days including a target for collection this month. 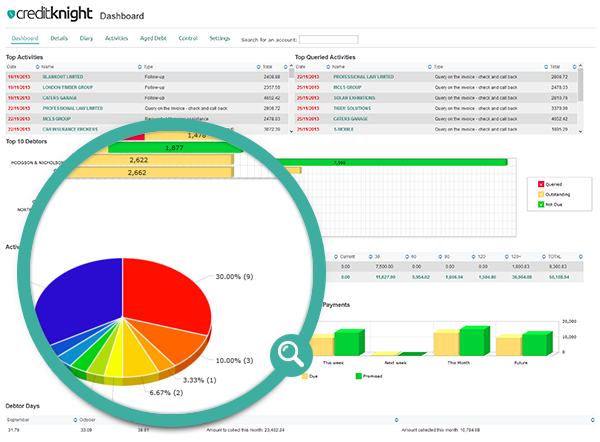 CreditKnight’s details function displays a summary of all the accounts in your database and provides a handy starting point for alphanumeric access to the details of an individual account and a handy search facility too. 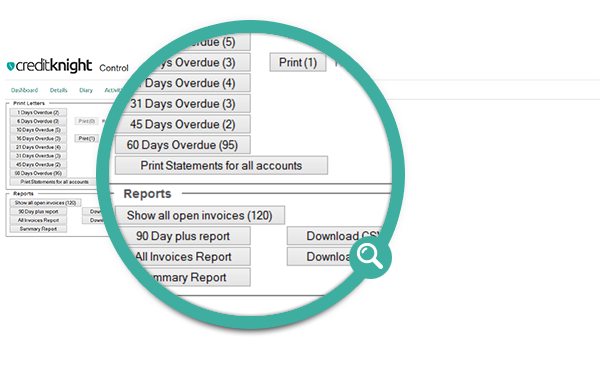 You can search for accounts by account number, name or geographic location and get all the information you need to chase the account and assess the current position of all your outstanding invoices. You can also add activities and update queries from this area too. 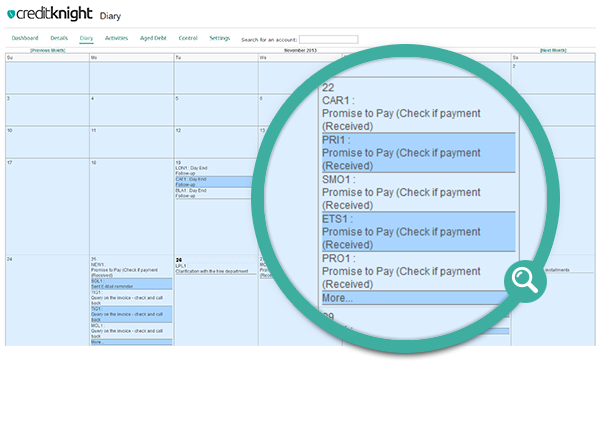 The Creditknight diary reminds you who needs to follow up when and why, enables you to keep on top of promised payments and disputed invoices. Views available of all, open, closed or PPY (pay per year) activities. Each of the above categories can be interrogated by date, account, query code and debt value. A calendar action journal which records the communication of action taken on particular debts together with corresponding promises from the customer. The view can be sorted by each column. A CreditKnight user can then choose to print “chase” letters for individual or all categories at their discretion, produce reports and even upload accounts and invoices with csv files. Users also have the option of running a “cash script” which will update the information with the system from your accounting system, the system will do this automatically, but you also have the function to run this manually.